Holiday Floss Wesenberg - our converted rafts as floating boathouse. By May 2016 was in a quiet location, 1km away from the spa town of Wesenberg, a landing stage, extensively renovated and provided with a small harbor master office and a modern plumbing. In this context, two former rafts are offered as fixed-fitting floating boathouses for rent. These rafts were extensively refurbished and a cottage converted accordingly. You get to the cabin lockable glass windows & glass doors. The water supply is now over running hot & cold water. The toilet runs flush and there was built a neat kitchen. In addition, the Holiday rafts got shore power with several outlets and new DIVERSE storage cabinets and cupboards. The terrace is just like the sun deck (roof) with a 60cm high wooden fence remodels, so that children can move freely here. The holiday rafts offer countless included services such as utilities (electricity, water, sewage), free use of shower and sanitary facilities of the port, parking, pillow & mattress pads, as well as a 4-canoe or a rowing boat per house. Enjoy your holiday raft from a fantastic view over the Woblitz in glorious sunrise or Sunset. Fishing your dinner right from your home and jump directly from the holiday raft into the water. Experience nature with the 4p canoe or rowboat and discover the Mecklenburg small lakes. Who wants something more, can book for 20% off the rentable rafts and boats in the harbor for day trips. ...Hausboot, ausgestattet mit allem was nötig ist. Sehr saubere Duschen und Toiletten, sehr nette Vermieter. Wir hatten eine wirklich sehr schöne Zeit dort. The jetty on which there are the holiday rafts located about 2km from the city center of Wesenberg. It is located right on Woblitzsee quiet location away from the residential area in the countryside. Approximately 200m away is a quiet beach and the bike path from Neustrelitz to Wesenberg Mirow. Wesenberg is a spa, which has open on Sundays in the summer. Here you will find supermarkets, cinema, bakery, restaurants and more. For Baden invites besides Woblitz also the White Sea as a crystal-clear lake. Neustrelitz is located 20km and also offers next to a theater other sporting activities such as tennis, squash, bowling, fitness and much more. Approximately 1.5 km to the train station for the local train between Neustrelitz and Mirow. 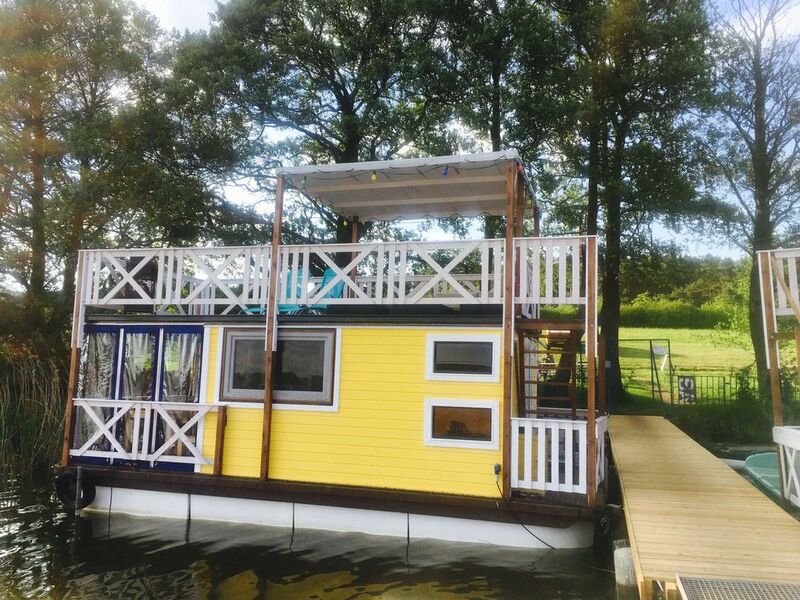 Guests can also rent a boat at the landing stage, and day trips to Neustrelitz (2.5h) or perform in the Mecklenburg small lakes.